Bothered by double data entry? Pestered by pen and paper scheduling? If your pest control service is bogged down in pesky administrative nonsense, it’s time you introduced yourself to pest control software by Smart Service. This QuickBooks-integrated powerhouse is the name in pest control management software for scheduling, dispatching, chemical tracking, and more! Boost your pest control business today with Smart Service—the #1 pest control software! With the help of Smart Service, QuickBooks becomes the pinnacle of pest control technology. 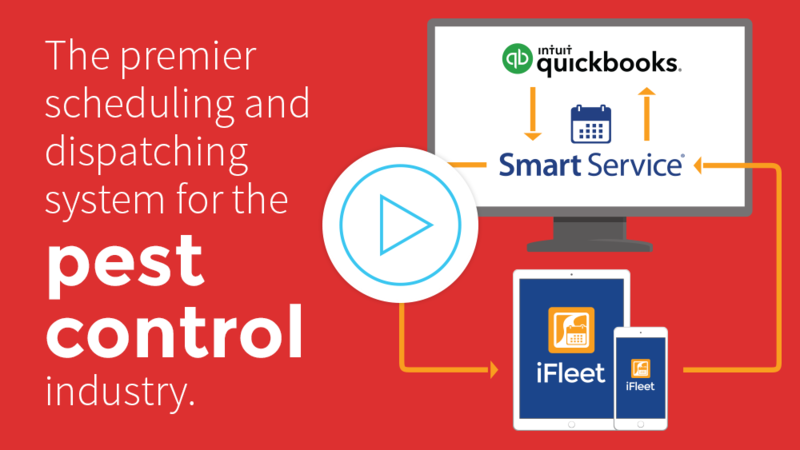 Smart Service is a QuickBooks add-on that gives the accounting software the ability to schedule jobs, dispatch jobs, track equipment, monitor employee progress, track chemical usage, and do everything else your pest control company needs. Learn more. If you haven’t started with pest control software, your customer management system probably costs you a lot of wasted time every day. Don’t rely on old, musty filing cabinets full of moldy work orders covered in slapdash handwriting. Digitize your customer records to make everything important available at the click of a mouse. Learn more. Smart Service pest control software offers some killer functionality to help companies keep track of their chemical usage. Make one record of what substance was used (and what pest was sprayed for), and Smart Service will make that data available across all of the devices used by your pest control company. Keep everyone on the same page with our pest control management software! Learn more. Once you’ve gotten a taste of the Smart Service mobile app, there’s no going back! Replace your junky clipboards with a pest control software that does it all. From the moment your team steps onto the customer’s premises, they’ll have everything they need to make you proud. Job notes, service schedules, customer information, work histories, custom forms…these and more will be at their fingertips with the Smart Service pest control business software! Learn more. Smart Service has helped us avoid a lot of double entry and has allowed us to go mobile! The pest control software king, Smart Service helps companies of all shapes and sizes. Learn some of the ways successful businesses put pest control software to use daily.